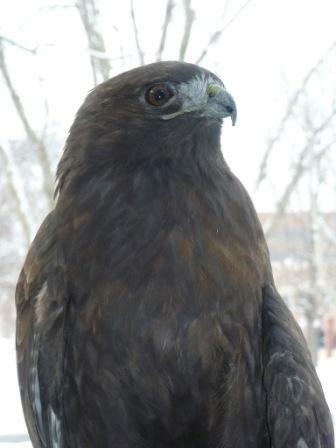 If you haven't visited The Raptor Center, then you might not have met Omaha, one of our winged ambassadors. Omaha was found starving with injuries to his left wing in the winter of 2002 in Omaha, Nebraska. An x-ray showed he had sustained a gunshot wound that fractured his left humerus. The bone had healed abnormally, causing him to lose proper mobility in that wing. 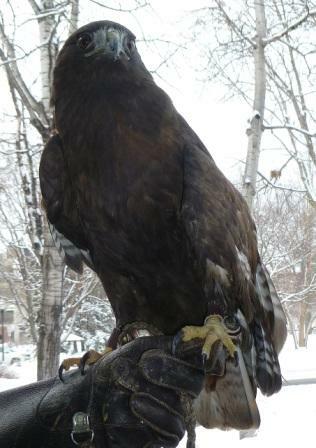 This meant that the young hawk, hatched in 2000, could never be released into the wild. 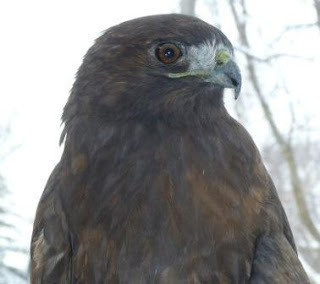 He now helps TRC educate the public on how hawks and other raptors assist with ecosystem health, and how we all interact with our environment. He is also a great example of the range of plumages for red-tailed hawks. We think he's a very handsome bird!